Sure, social media takes a lot of time, but probably not as much time as you think. Too many companies and organizations are reinventing the content wheel for every social outpost they maintain. A better approach is to create a content ecosystem that allows you to repurpose and cascade your best information. Instead of a series of self-contained initiatives, build yourself a content ladder. If you want a new pair of glasses, the Yellow Pages is a frustrating neighborhood. Look under “G” for “glasses.” Not found. Look under “E” for “eye glasses.” Nope. Only when you look under “O” for “optometrists” do you find what you need. It’s an example of an industry with poor understanding of taxonomy – the words and phrases used to describe products and services. Taxonomy is incredibly important in social media because it’s the most direct link between the worlds of social and search marketing. Remember, your most important customer is Google, and your content ladder needs to maximize your chances for search success. 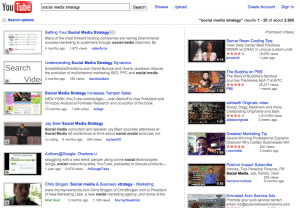 When creating and promoting social content, include specific, relevant keywords and search phrases wherever possible. (This is especially important now that Google and Bing are incorporating social content into real-time search results). 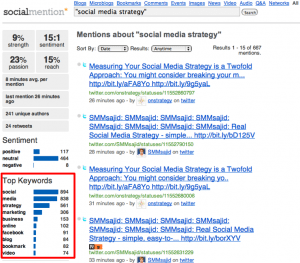 Look at your keywords report to find phrases that are driving traffic to your site. I recommend using a mixture of your Top 25 phrases and some that are highly relevant to your business, but perhaps aren’t sending as much traffic as you’d like at present. Go to www.socialmention.com and search for your company or product name (in quotes), and set the pull-down to “all.” You’ll then see a search results page that shows a comprehensive list of places you’ve been mentioned on the social Web. On the left hand side, you’ll see a keywords chart that lists common terms associated with your name in social media. Consider adding some of these to your list if they differ from your analytics results. How your company or product are referred to in consumer-created Twitter lists can yield important taxonomy insights. Go to your Twitter account, and click on “listed” next to your followers count, and see how the lists that include your Twitter account are named. Consider including some of these phrases to your master keyword list. Incorporate your phrases into your social content wherever possible, but only when relevant. Nobody appreciates keyword spam on the social Web. Creating successful social media content isn’t just status updates. Take your top keywords (including your company name, product name, etc.) and search for them on Google, Bing, YouTube, Twitter, Facebook, and SocialMention. What shows up in these search results? How much photo and video content appears? Content from your competitors? From fans? You’ll be amazed at how many content-creation ideas this simple exercise can generate. The key to a content ladder is organizing your rungs. Your scenario may of course vary, but for illustration purposes let’s assume you have a Twitter account, Facebook fan page, blog, and email newsletter. Create your own integrated frequency schedule to better understand how your outposts interrelate. Create a piece of content (remember to include your key phrases), and post it to the first rung in the ladder (Twitter, in this case) Use a tracking system (I prefer bit.ly) to determine how popular that specific piece of content was with your audience. Remember however, that many factors influence popularity at the individual content piece level. Don’t make assumptions – test them. Vary time of day, day of week, phrasing, link placement, and other options, and thoroughly document your results. Social media scientist Dan Zarrella has some excellent research on social content best practices. The content pieces that are most successful on the first rung of your ladder should be appropriately tweaked and redeployed on the second rung of your ladder (Facebook). Test and track content success on Facebook using bit.ly (or number of likes and comments), and add the most effective content pieces to the next rung on the ladder (blog). Note that as you move down the ladder, your repurposing will be more complex – a blog post requires substantially more content than a Facebook update in most cases. If a piece of content is successful on your blog (measured by visits as determined by Google Analytics, perhaps), add it to the next rung – your email newsletter. By understanding how your various social outposts can work together at the content level, you can develop meaningful efficiencies. Also, because a sprinkling of the content included in the lower rungs of your ladder has already proven successful on higher rungs, the relevancy and popularity of your content should increase for most fans/readers/subscribers. 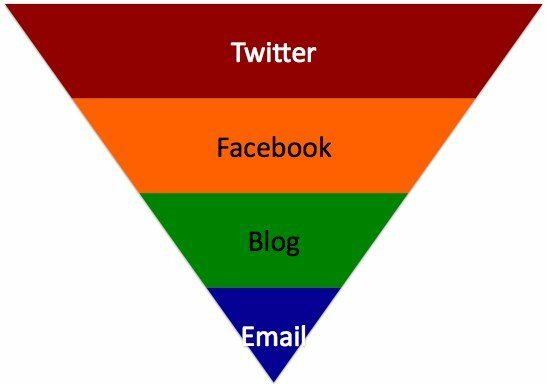 Of course, this content ladder approach assumes that you do not have the exact same audience for each of your social outlets, and I believe that to be an entirely realistic assumption. You may have some overlap (especially with Facebook and Twitter), but consumption of status updates and consumption of blog posts and email newsletters are meaningfully different activities, and attract different groups of fans.